My business partner Katey recently shared with me a video of Meghan Trainor’s song “Better When I’m Dancing” from The Peanuts Movie and asked if I had heard it. I hadn’t, but I loved it and knew immediately I wanted to adapt it for use in music therapy sessions and classes. I might have had just a little too much fun with the instrumentation and vocals on this recording — and by that I mean I was literally dancing in my chair while I worked (it kept my baby entertained, at least!). As much as I enjoy writing completely original songs, I love to throw in a good cover every once in a while, especially one from a popular artist that many of my kiddos will recognize. Listening to this song is an instant mood lifter and will hopefully inspire my students and clients to dance along, too. Can’t wait to sing it with them this week! I’m really lucky that my colleague Katey is crafty, because when it comes to anything involving sewing, I certainly am not. She volunteered to make ribbon streamers for the most recent session of our early childhood classes, and I did my part by coming up with a song for them. This is a simple song with a repetitive, familiar melody, because the focus is on movement and following directions. Each verse features a different way to manipulate the streamers, and it is so much fun to see our kiddos get creative with their interpretation of each. They also help come up with additional movements. The streamers that Katey created are perfect for the 0-3 crowd, because they are attached to loose fabric-covered elastics that can be worn around the children’s wrists. While the older kids like to see how many they can pile on to each arm, the tiny ones can participate without having to actually grasp and hold onto the streamers. 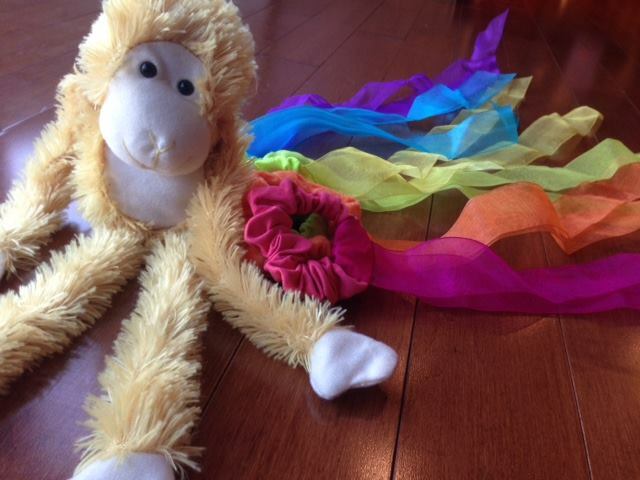 Here’s a photo of Katey’s creations, pictured with one of our monkey friends (which we use for this song) from class. Of course, the streamers can be substituted for fabric scarves or other props you already have on hand. I simply change the words when I use this song with scarves or ribbon rings in other settings. The first time I sing this song with a group of kids, it catches them off guard — which is exactly what I was going for when I wrote it. There they are, all ready to wiggle their fingers/toes/knees/etc. and BOOM! I drop the “W” bomb on them. No child likes to wait, but learning to be patient is an important skill even at an early age. So is listening carefully, which are two goals for the song Ready, Set, Wait. The other include body part identification, motor skills, and following directions. 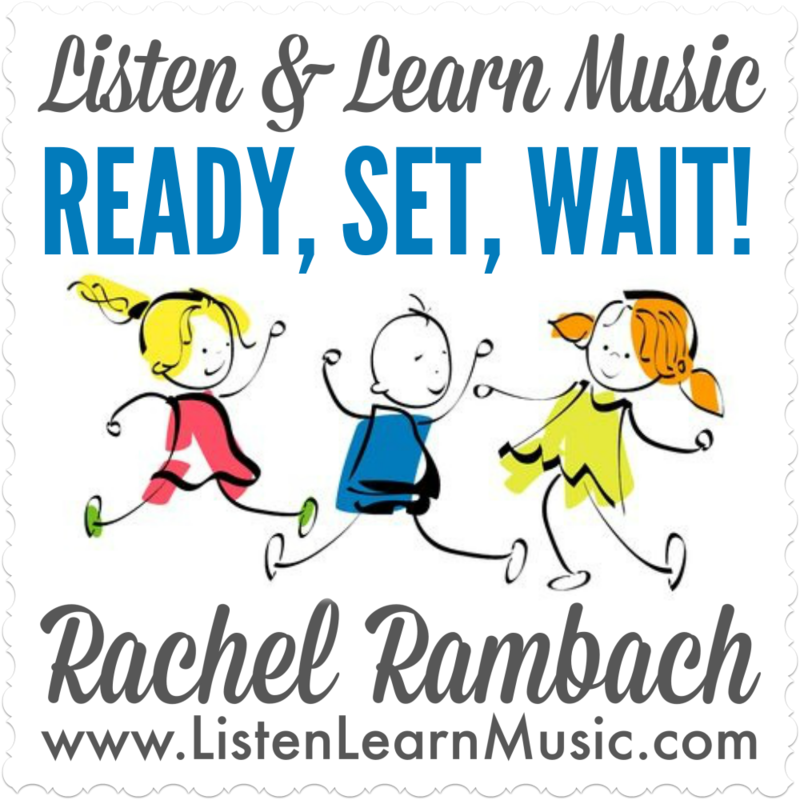 Once my students get used to hearing “wait” before it’s time to wiggle, I like to change it up on them and skip right to “go”. This is an excellent way to test their listening skills (and give them a good giggle). I included this song in our current early childhood music class session, and it’s been an earworm around our studio these last couple of weeks. As annoying as that can get, it’s also the sign of an effective song…especially where kids are concerned! This isn’t the first time I’ve mentioned what a HUGE fan I am of the movement props created by Bear Paw Creek. Their stretchy bands and connect-a-bands are both staples in my collection, and I just recently added their bean bags as well. I wrote “I Have a Bean Bag” with several goals in mind: listening skills, body part identification, and imitation. An added bonus skill this song addresses is balancing, which is funny to watch my kiddos try to do once they’ve placed the bean bag on the correct body part. 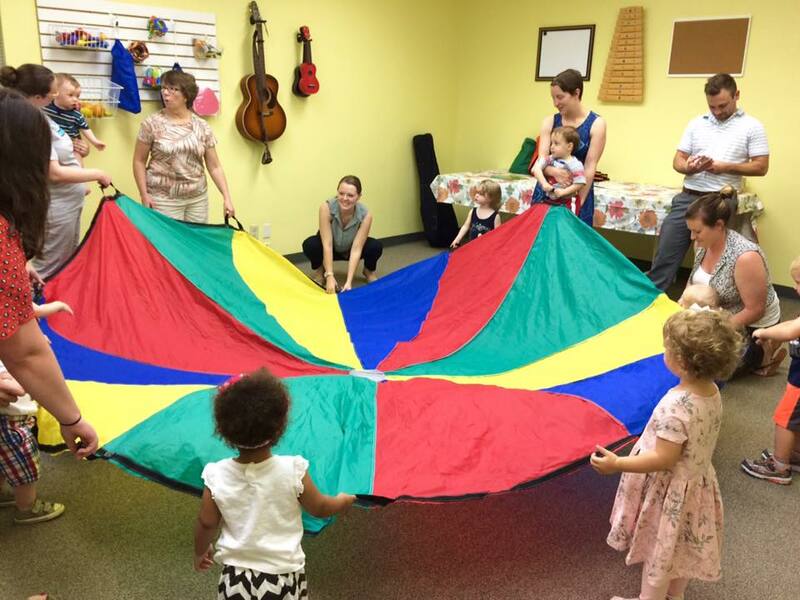 Although this song was written with bean bags in mind, I’ve already adapted it for scarves in bigger groups where I don’t have enough bean bags to go around (yet!). A special thanks goes to Janet Stephens, owner and creator of the products at Bear Paw Creek, for her support of Listen & Learn Music. Everything in her shop is made right here in the U.S.A. and is of the utmost quality. Please check out her movement props and other resources if you haven’t already!